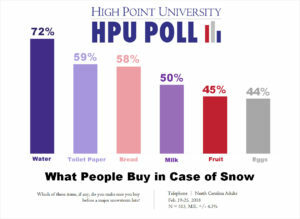 HIGH POINT, N.C., March 12, 2018 – As winter weather approaches the East Coast and North Carolina, a High Point University Poll surveyed North Carolinians on the popular claim that they stock up on bread, milk and other supplies when the threat of a winter storm looms. The poll finds that a majority of North Carolinians say they make sure to buy water, 72 percent, while smaller majorities stock up on toilet paper (59 percent), bread (58 percent) and milk (50 percent) before major snowstorms. Fewer people say they buy fruit (45 percent) and eggs (44 percent) before a snowstorm.